Early Daredevil put all kinds of strange contraptions into his billy club. 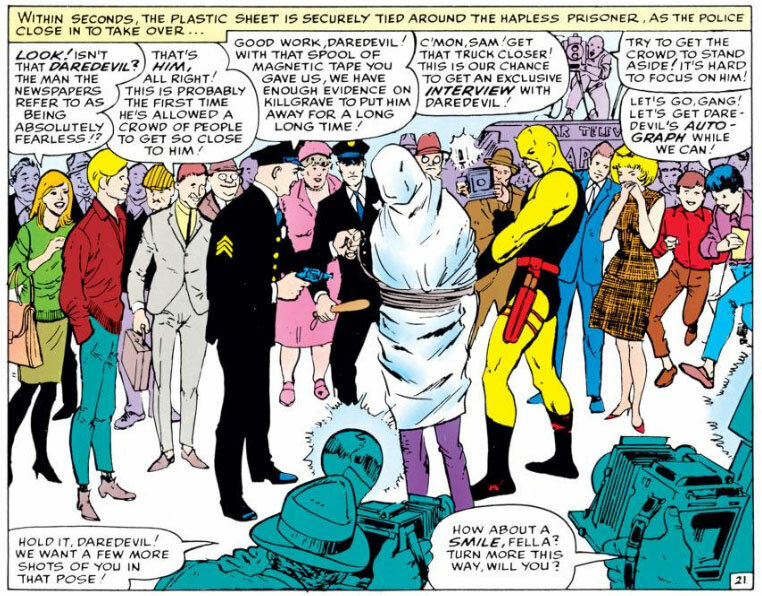 We saw a couple of the more bizarre examples of this in a recent post about when Daredevil guest-starred in the Fantastic Four. 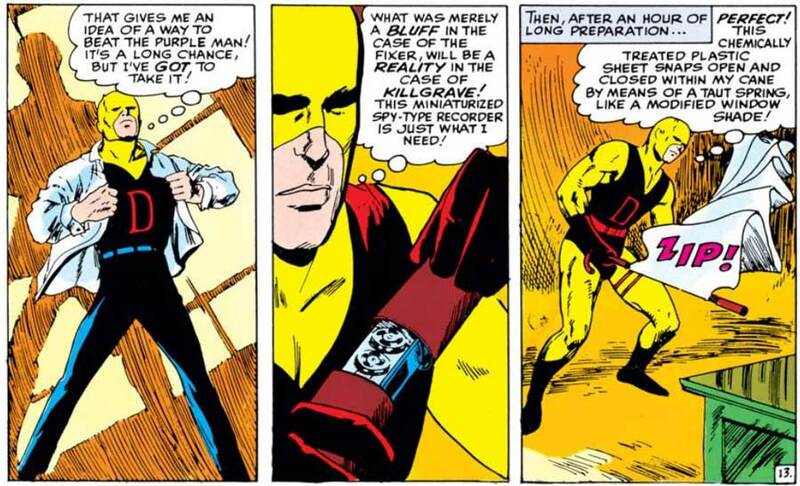 Below is another chuckle-worthy case from Daredevil #4, by Stan Lee and Joe Orlando, which saw Daredevil go up against the Purple Man. Interestingly, this isn’t the only exciting thing to happen to the billy club this issue. With the plastic sheet and the tape recorder already in place, we also learn that the billy club can transform into a boomerang. Apparently, having a bunch of stuff inside the billy club does nothing to hinder its ability to bend and twist! When it comes to putting the sheet to the test, it is clear that it performs admirably! Exactly what kind of chemical it was treated with is unknown, as is just how Daredevil would know which chemical coating might be best suited to counteract the (also) unknown chemical released by Purple Man’s skin. 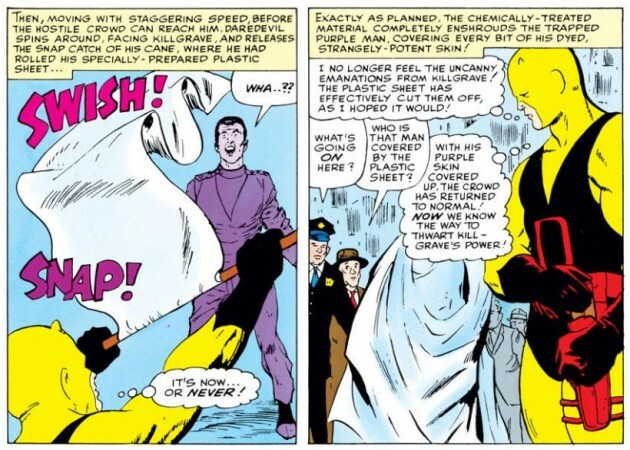 But, the biggest mystery here isn’t really the chemical coating, but how the bath towel-sized sheet managed to grow large enough to cover Purple Man completely. In the panel above, on the right, it looks significantly larger than anything that would fit inside a billy club! Where is DD supposed to be in the last panel of the first set of pictures? It looks like he’s underground. Did Matt have a Bat cave in the old days? Although I guess the nonexistent background is the least goofy thing in all this. It’s almost like having super senses just wasn’t enough for Stan Lee. Matt had to double as Batman, but instead of a utility belt he had his amazing, magical, du ex machine billy club. I think Stan thought having a blind superhero was a great idea, but for some reason it was so impractical compared to all the other fantastical things he created that he was constantly trying to compensate for it. Which gave rise to the “fix all” radar sense and the “do all” billy club. Hey, remember “Fall From Grace” when Matt redesigned his suit while choosing high tech fabrics ? I’m wondering how Purple Man can breathe while wrapped in plastic.